Las Vegas, April 25, 2017 – Semtech Corporation (Nasdaq: SMTC), a leading supplier of analog and mixed-signal semiconductors, and LYNX Technik AG, a developer of equipment for broadcast and professional AV signal processing applications, announce the integration of Semtech’s high-performing UHD-SDI solutions into LYNX’s revolutionary UHDTV-capable video processing platform, the greenMachine titan. A new concept in video and audio processing platforms, the greenMachine hardware is a generic processing unit with flexible inputs and outputs and scalable processing power. By installing different software applications (APPs), the greenMachine provides precisely tailored processing to fit a wide range of end-user requirements. 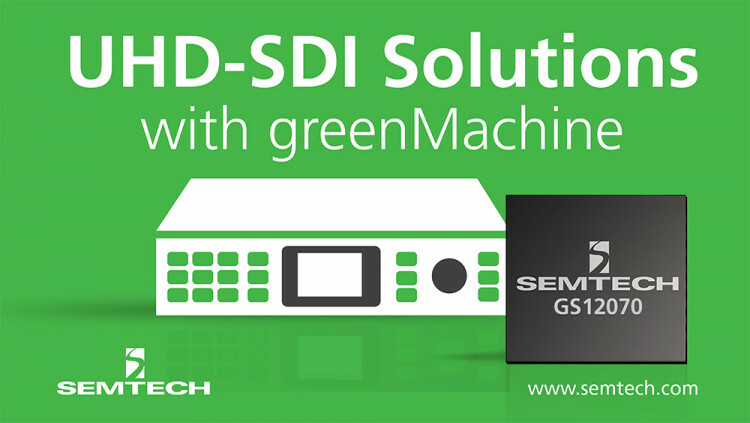 Semtech’s award winning UHD-SDI GS12070 Gearbox is a key enabler of greenMachine’s strong flexibility. Semtech’s GS12070 UHD-SDI Gearbox is a revolutionary product with the configurability to perform both multiplexing and de-multiplexing between different UHD-SDI single- and multi-link interfaces. The device supports emerging 12Gbps and 6Gbps UHD-SDI interfaces as well as existing 3G-SDI and HD-SDI. The Gearbox allows the seamless integration of end-products using 12Gbps UHD-SDI for 4K UHDTV applications into the pre-installed 3G-SDI based broadcast infrastructure. Single-link 12Gbps UHD-SDI to Quad-link 3G-SDI conversion, in both directions, is just one of the many features of the GS12070 UHD-SDI Gearbox. LYNX Technik AG is a German company specializing in the development of high quality products for the professional and broadcast market sectors. Our multi-talented Engineering team has decades of accumulated experience in the broadcast and post production fields and have been honored with individual engineering Emmy awards for outstanding engineering achievements in this field. For more information, visit www.lynx-technik.com. All statements contained herein that are not statements of historical fact, including statements that use the words “designed to,” or other similar words or expressions, that describe Semtech Corporation’s or its management’s future plans, objectives or goals are “forward-looking statements” and are made pursuant to the Safe-Harbor provisions of the Private Securities Litigation Reform Act of 1995, as amended. Such forward-looking statements involve known and unknown risks, uncertainties and other factors that could cause the actual results of Semtech Corporation to be materially different from the historical results and/or from any future results or outcomes expressed or implied by such forward-looking statements. Such factors are further addressed in Semtech Corporation’s annual and quarterly reports, and in other documents or reports, filed with the Securities and Exchange Commission (www.sec.gov) including, without limitation, information under the captions “Management’s Discussion and Analysis of Financial Condition and Results of Operations” and “Risk Factors.” Semtech Corporation assumes no obligation to update any forward-looking statements in order to reflect events or circumstances that may arise after the date of this release, except as required by law. Semtech and the Semtech logo are registered trademarks or service marks of Semtech Corporation and/or its affiliates.